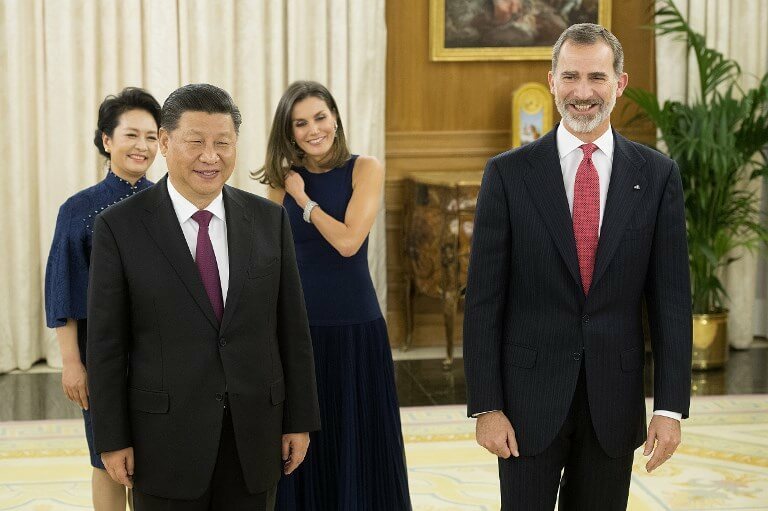 China’s President Xi Jinping arrived in Spain on Tuesday for a business-focused state visit as Beijing, currently engaged in a trade war with the United States, seeks to strengthen ties with Europe. Xi accepted a bouquet of red flowers from children after disembarking from the Air China plane. He later met King Felipe VI and his wife Queen Letizia on Tuesday evening at the Zarzuela Palace on the outskirts of Madrid and will hold talks with Prime Minister Pedro Sánchez today. No press conference is scheduled during his three-day visit, which is a stop-off on his trip to a meeting of Group of 20 leaders in Argentina. ‘Spain is an important member of the EU; it is also China’s good friend and good partner in the EU. We hope and believe that Spain will continue to play a positive role in the EU for the sound and steady growth of China-EU relations,’ Xi wrote in a column published in conservative Spanish daily newspaper ABC. It is the first state visit to Spain by a Chinese president in 13 years. The visit comes as the two countries celebrate the 45th year of ties. Both sides will sign at least 18 business and cooperation deals, including one that further opens up the lucrative Chinese market to Spanish products such as its treasured ‘jamon’ cured ham which is much prized in the Asian country, the Spanish government said. The world’s top pork consumer, China has started getting a serious taste for ‘jamon’ which is sold there as a luxury product. Spanish companies are hoping to expand their exports to the Chinese market. China is Spain’s largest trading partner outside the European Union. While Spanish exports to China increased last year by 28.3%, it still has a trade deficit of 19.4 billion euros, a 2.3% increase over the previous year, according to Spanish foreign ministry figures. ‘It is a market where we have to be more and more present, and this trip opens the opportunity for us to be able to talk about issues both from the public sector and from the private sector that will deepen these relationships,’ Spain’s secretary of state for commerce, Xiana Margarida Mendez Bertolo, said at the first meeting of a new forum for Spanish and Chinese businesses in Madrid. Spain, however, will not sign on to China’s ambitious ‘One Belt, One Road’ initiative that seeks to better link Asia and Europe, a senior government official said Tuesday ahead of Xi’s arrival. Beijing plans to develop the network through 65 countries representing an estimated 60% of the world’s population and a third of its economic output. So far, around 70 countries have signed a memorandum of understanding pledging their interest in the project – an agreement that Beijing values as it seeks to expand the concept. Xi will stop off in Portugal on 4-5 December on his way back to China from Argentina. At the Group of 20 summit Xi is due to meet with US President Donald Trump, who has imposed tariffs on more than $250 billion in Chinese goods in an attempt to pressure the country to reverse alleged unfair trade practices, such as the forced transfer of intellectual property and massive state intervention in markets. China responded by slapping tariffs on $110 billion in US goods.